In 2005, in the contextual essay for the survey, Claiming Ground: Twenty Five Years of Tasmania’s Art for Public Buildings Scheme, I commented that while Tasmania’s public art did not always follow that experienced overseas, differences could be largely explained through the state’s lack of critical mass in terms of population, economy and political will. In the USA, for instance, the 1970s saw contemporary sculpture taken into the urban forum in an effort ot compensate for a degraded urban environment and nostalgia for lost nature. While Christo’s Running Fence crossed Marin and Sonoma counties, Tasmania was attracting people into the wild nature that was the Gordon and Franklin Rivers, the centre of international environmental protests against the building of the Franklin Dam. Permanent public artwork was not a significant element in these events, however a unique identity for the state was being configured beyond its borders, and in the public mind, through the emerging contemporary genre of wilderness photography, exemplified in the work of Peter Dombrovskis. The new identity was taken up as reflecting both the popular image of Tasmanian nature and the equally enduring impress of colonialism. 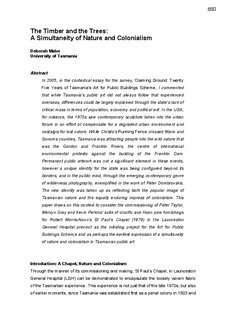 This paper draws on this context to consider the commissioning of Peter Taylor, Mervyn Gray and Kevin Perkins’ suite of crucifix and Huon pine furnishings for Robert Morris-Nunn’s St Paul’s Chapel (1979) in the Launceston General Hospital precinct as the initiating project for the Art for Public Buildings Schem,e and as perhaps the earliest expression of a simultaneity of nature and colonialism in Tasmanian public art.